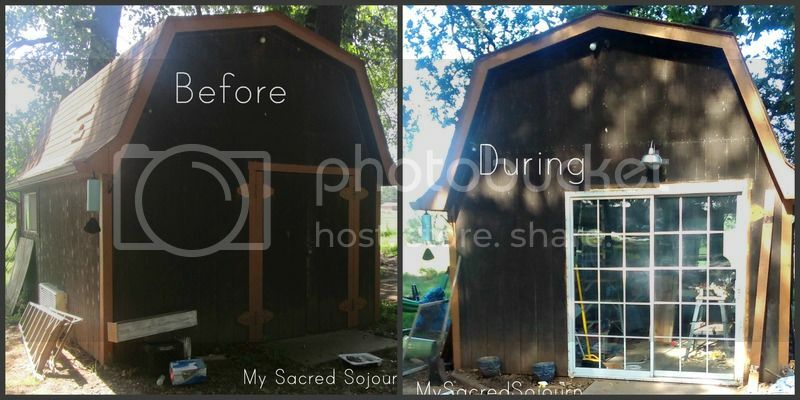 My Sacred Sojourn: Shed-to-Classroom Makeover Update: 28 Days In! 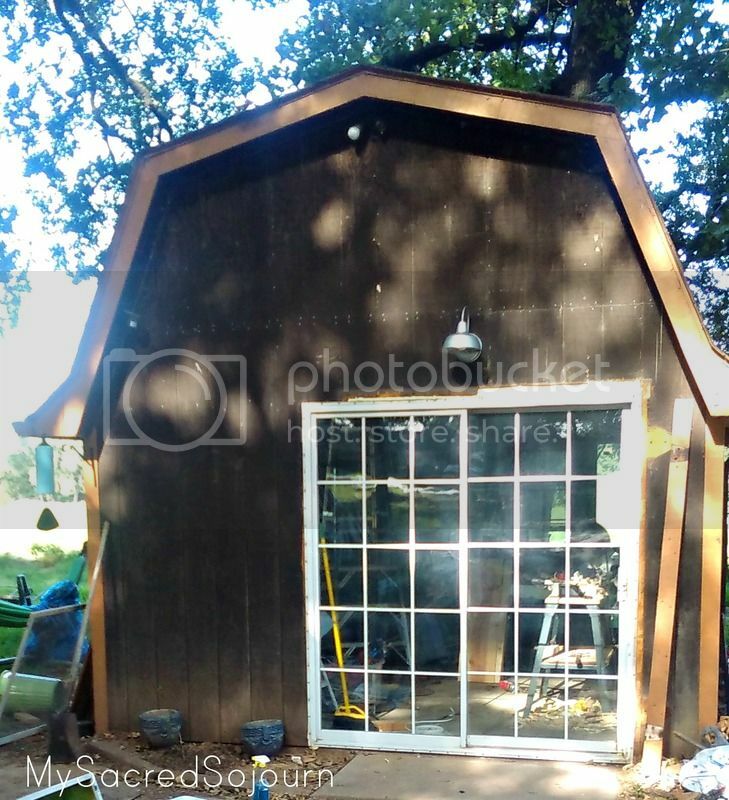 Shed-to-Classroom Makeover Update: 28 Days In! 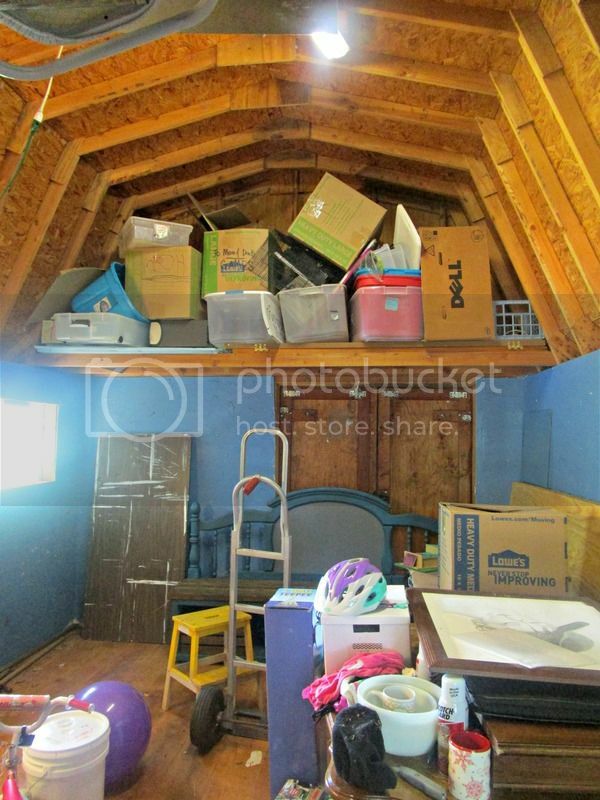 I shared here how we're converting an ugly old outbuilding with loads of potential into a light, bright homeschool room! That post was published on July 7, so we're 28 days into the project. I planned to share this post on Monday, but glad I waited...my husband made some huge strides last night! But then a friend gave us a sliding glass door they had pulled out during their home remodel. For free! 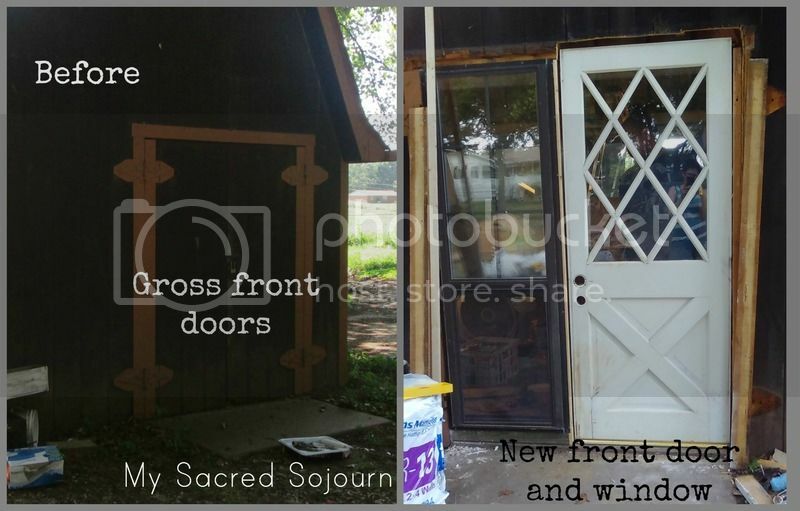 (No worries...the white door will go in our tiny house!) Also, can I just lament all the construction mess for a moment? So. Much. Mess. You can also see the new porch light here...a cute little nickel farmhouse-inspired piece from Lowe's. When we started on the inside, it was dark, dingy, and full of junk. Here's where we stand now. Let's face it, it's still full of junk, but at least it's construction junk?? :/ Again, with the construction mess. Ahem. 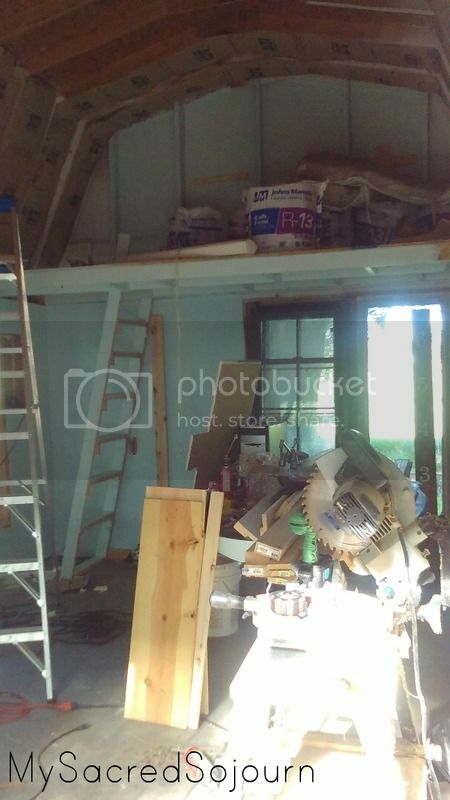 Michael added windows to the back (from Habitat ReStore), a new window on the south/left wall, built out the loft so it's 4' deep, and built the ladder. It's all painted the same pale blue shade as the walls. 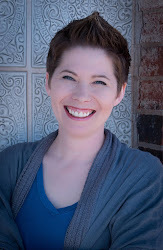 The loft will become a reading loft! 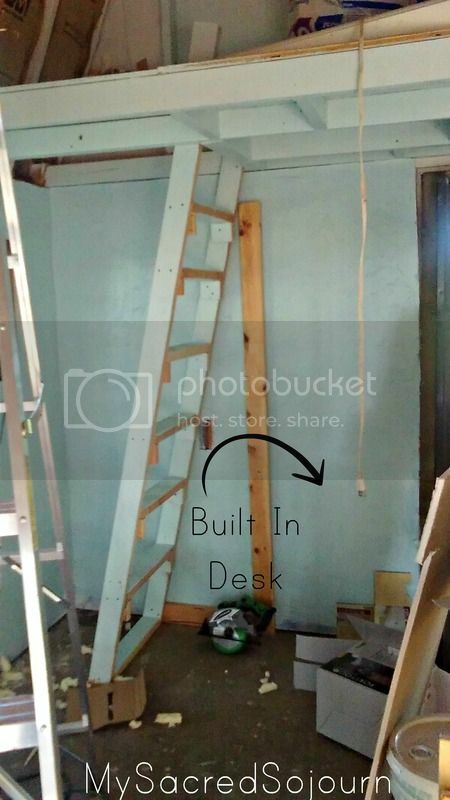 Our original plan was to have the ladder against the wall so we wouldn't lose any floor space. But after much debate, we decided this was safer. That created a little nook area, so we've decided to do a built-in desk to hold our school computer. We don't use the computer much, but it'll be nice to be able to watch our math DVDs, movies from the library, etc. out in the classroom. Here's the Master To-Do List. I've marked out what's completed...there's still a long way to go, but we're working hard to finish up by mid-August so we can start school! Repair the roof...bad storm sent a limb through the roof. Paint the walls and ceiling Decided against painting the ceiling; added insulation and we're going to cover it with something really cool!! Install the feature wall (I'm so excited about this idea, but I'm not sharing what the plan is until it's done! Yea for surprises!!) Decided against the feature wall; I don't want it to compete with the ceiling. Paint or stain the table and chairs Started on this and I hate how it turned out. Back to the drawing board! Install porch roof and light We decided to hold off on building a porch roof, but light is installed! To stay up to date, follow me on Instagram...I've been posting a few pics as we go. And I'm planning to do a video tour soon! What do you think so far? Any suggestions? 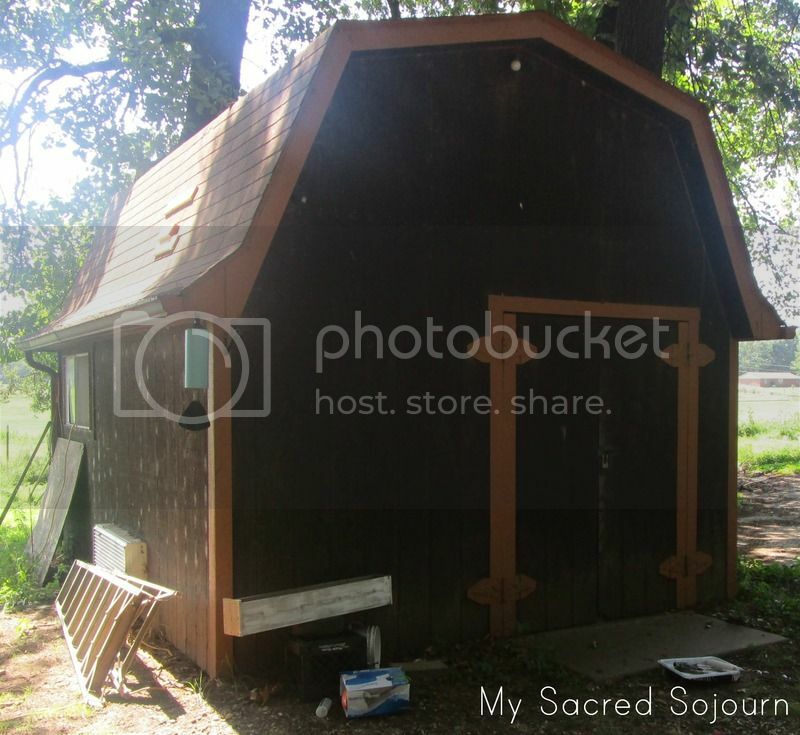 What would you include in your homeschool room or art studio if you were starting from scratch?